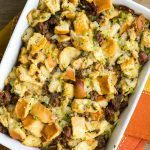 Classic Sausage Stuffing is a must-make recipe for your Thanksgiving dinner! This savory combination of ingredients will bring your dinner together and leave everyone satisfied! Place a large skillet over medium-high heat. Cook the Italian sausage until browned and no longer pink, about 8 minutes. Transfer the sausage to a bowl and set aside. Leave the grease in the skillet. Add 2 tablespoons of butter to the same skillet. Once the butter has melted, add the celery and onions. Stir to coat the veggies in the fats and cook for 3 to 5 minutes until the onions are softened. Add garlic, stir and cook for 2 more minutes. Remove from heat and set aside. Place the bread in a very large mixing bowl. Pour the celery mixture over the bread. Add the chicken broth, eggs, salt, pepper, sage, and parsley to the bowl. Mix gently until combined. Add the sausage and mix once more. Coat a 9-inch x 13-inch baking dish with non-stick cooking spray. Transfer the stuffing to the baking dish and spread into an even layer. Dot the top of the stuffing with the remaining butter. Bake for 45 to 50 minutes or until the top is crisp and golden. Carefully remove from the oven. Serve immediately (it'll be HOT!) or let sit for 5 to 10 minutes for serving. Buy your french bread ahead of time and leave it on the counter for 1 to 2 days to get a bit hard. This will help give the stuffing more texture. Or you can cut the bread and toast it in a 300 degrees oven on a baking sheet for 8-10 minutes. I have not made this recipe with the store-bought stuffing mixes. You can try this substitution if you like, but the number of servings will vary.